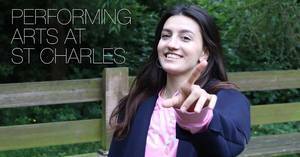 During her time at St Charles Diamantina studied Performing Art s, Music Tech, and English Literature and has recently graduated from a BA (Hons) Songwriting course. If that wasn’t enough to keep her busy, she has also toured Britain in a production of Sister Act Live Choir, appeared on television in BBC1’s ‘All Together Now’, and been offered recording contracts. Diamantina attended several college open days before making her choice of sixth form college, ‘St Charles was the most welcoming’, she said. She fondly recalls her time with Ms Nash, Head of Performing Arts, who would regularly offer support and give plenty of encouragement to make use of the theatre space to work through new ideas, rehearse, and build up confidence as a performer. In addition, Ms Nash would frequently organise theatre trips and workshops with renowned drama companies. Performing artists are regularly invited into the College to give students an insight into the life of professional performers, and this is something that Diamantina has returned to St Charles to do with our current students. She also recalls that there was plenty of pastoral support to keep students on track with their studies, and that students were encouraged to exceed expectations in their work.